In China, this species may have a one or two year life cycle, depending on the geographical region. The egg, larva, or pupa can overwinter. Young adults emerge from infested trees in May and may fly several hundred meters to search for a host. However, they tend to attack the same tree from which they emerged. Adults are active from early-summer to mid-fall. They feed on the bark of twigs periodically throughout the mating and egg-laying period. On sunny days the adult beetles are most active from mid-morning to early-afternoon. They usually rest in the canopy on cloudy days. 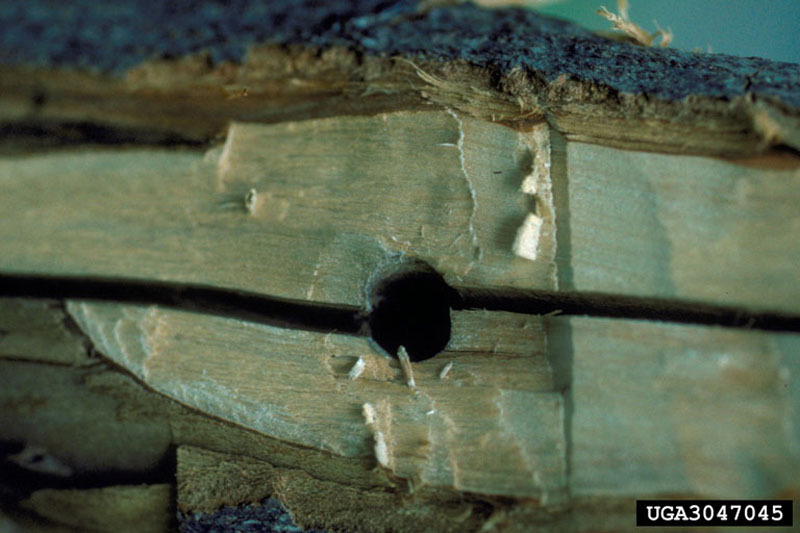 In preparation for egg-laying, females chew oval grooves in the bark in which they lay one egg about 5-7 mm in length. On average, each female will live 40 days and during that period will lay about 25-40 eggs. The wounds may occur anywhere on the tree, including branches, trunk, ans exposed roots. Eggs hatch in one to two weeks. Young larvae begin feeding in the phloem tissue and as they mature they migrate into the wood, creating tunnels as they feed. These galleries cause tree dieback and death. Larvae become pupae, then adults, in the tunnels in summer. The new adults exit the tree through large round holes about 10-15 mm in diameter created by the newly emerging adults. Dripping sap is often seen to be flowing from the egg-laying wounds. Piles of coarse sawdust around the base of the tree and in branch axils can be seen as well. 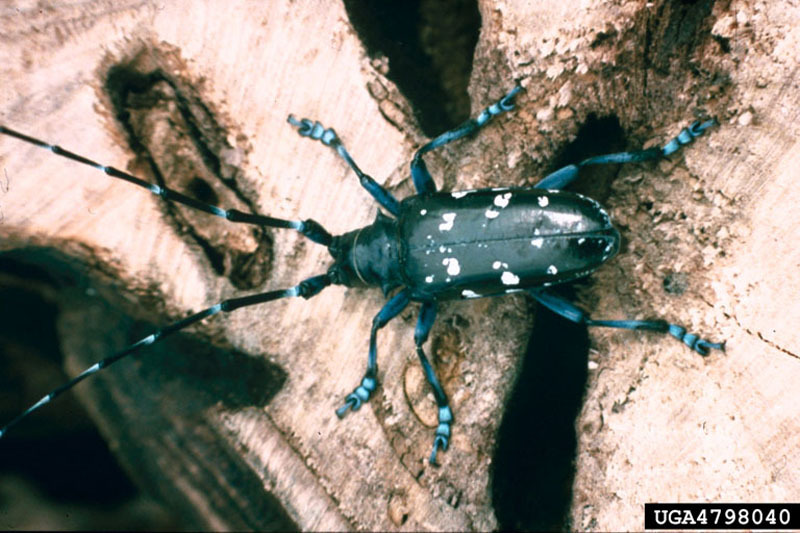 The adults are large bluish-black beetles (2.5 to 3.5 cm in length) with white spots and very long antennae. 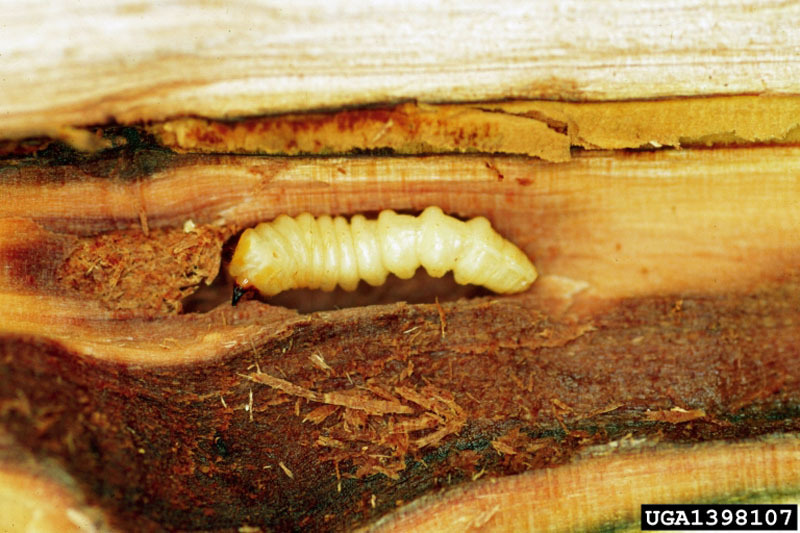 The larvae and pupae are normally inside the tree within the larval tunnels. Full grown larvae can reach 50 mm in length. In China, Anoplophora glabripennis is known as the "starry sky beetle" and is considered a major pest of hardwood trees in many parts of the country. 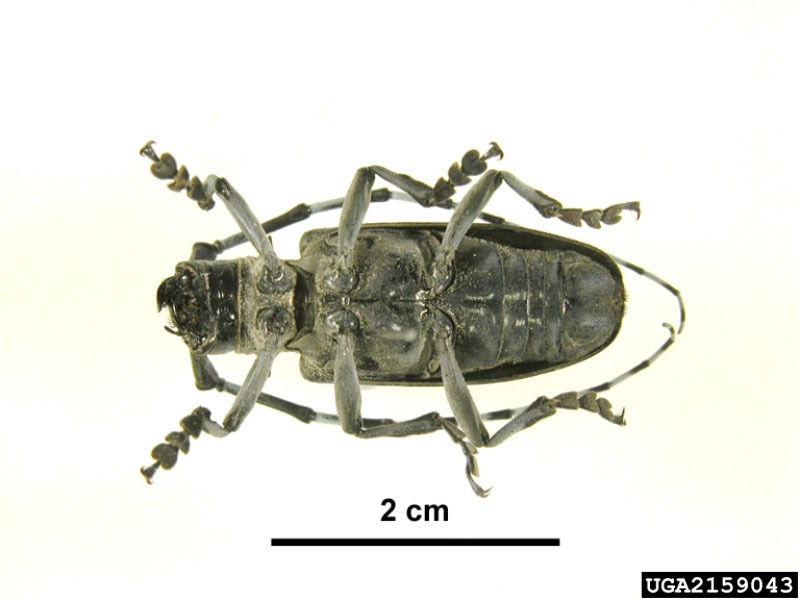 Based on the Chinese distribution and the current infestations in the United States and Canada, it has been shown that the beetle can survive well in the hardwood forests of southern Canada. 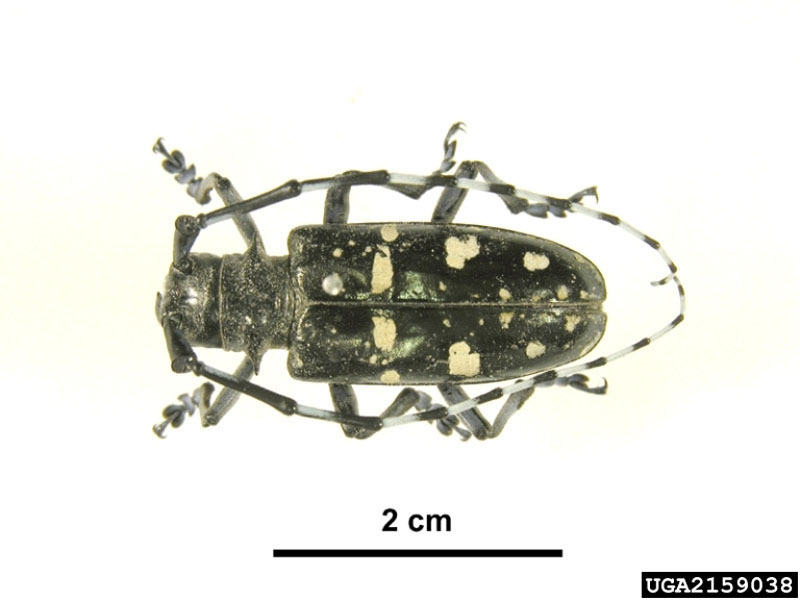 The first report of this beetle being established outside of its native range was from the cities of Brooklyn and Amityville, New York in 1996. Many trees were found to be heavily attacked, particularly maples. Quarantine and eradication procedures were quickly implemented to prevent further spread and to eliminate the population. In July-August, 1998, three separate infestations were discovered around Chicago, Illinois. In October 2002 an infestation was discovered in Jersey City, New Jersey. In September 2003 an infestation was discovered in an industral park located on the boundary line between the Cities of Vaughan and Toronto in the province of Ontario. All of these infestations are under strict quarantine control and are undergoing eradication. Humphreys, N.; Allen, E.; Humble, L. 1998. An Asian Long-Horned Beetle. Natural Resources Canada, Canadian Forest Service, Pacific Forestry Centre, Exotic Forest Pest Advisory 1, 2 p.
Troy, Kimoto, T.; Duthie-Holt, M.; Dumouchel, L. 2006. Exotic Forest Insect Guidebook. Canadian Food Inspection Agency, 120 p.
Ric, J.; de Groot, P.; Gasman, B.; Orr, M.; Doyle, J.; Smith, M.T. ; Dumouchel, L.; Scarr, T.A. ; Turgeon, J.J. 2007. 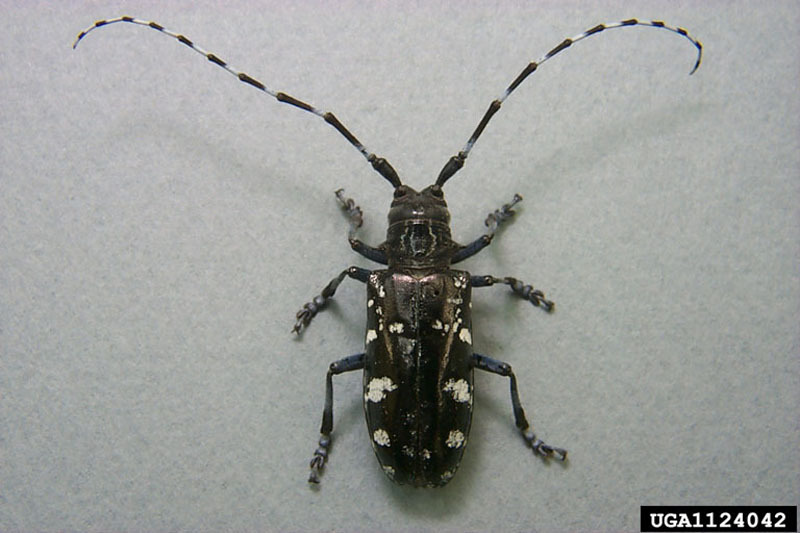 Detecting signs and symptoms of Asian longhorned beetle injury: Training guide. Natural Resources Canada, Great Lakes Forestry Centre, Sault St. Marie, Ontario, Canadian Food Inspection Agency. 118 p.
Phloeophagous : Feeds on phloem. Borer: Bores into and feeds on the woody and non-woody portions of plants.